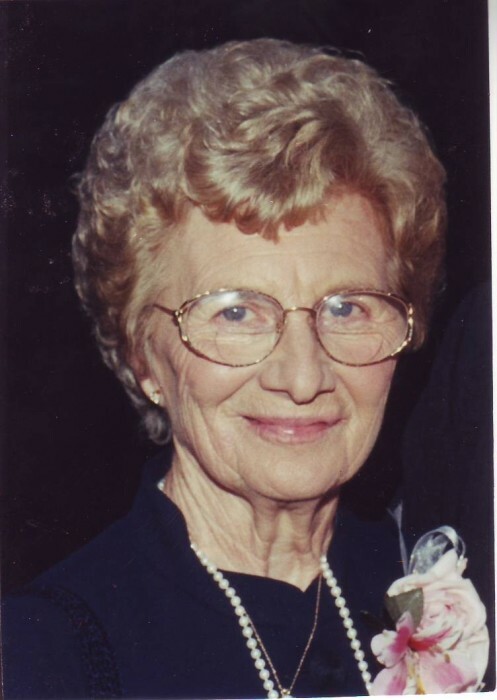 Margaret "Peggy" Namisniak passed away peacefully Friday, September 21 surrounded by her devoted family in the home that she loved following a brief illness. The oldest child of the late Michael and Anna Bazarnik Juli, Peggy was born May 23, 1928 in Auburn. She had just joyfully celebrated her 90th birthday. Peg's life was focused on husband, children, grandchildren and in recent years, great grandchildren. She and her husband, Andy "Snapper" Namisniak, owned Namisniak's (Snapper's) Tavern where Peg served lunch for many years. Her potato salad was a renowned side dish. She was a lifelong parishioner of Ss. Peter and Paul Ukranian Catholic Church and the oldest resident of her neighborhood where she will be sadly missed as frequent passers-by would look for her happily mowing her lawn several times weekly until forced to give up that task just earlier this summer. Peg was predeceased by her loving husband of near 50 years, Andrew "Snapper" Namisniak. After 18 years, they are now reunited in heaven. Surviving Peggy are her beloved children: three daughters and their husbands, Susan and John Barrette, Kathleen and Francis Callahan and Donna and Stephen Leary and her son and daughter-in-law, Thomas and Michelle Namisniak all of Throop. Peg cherished her seven grandchildren: Amy (Brian) Leeds, Allison (David) Warchal, Andrea (Mitchel) David, Kristina Callahan, Andrew Leary and Ryan and Nicole Namisniak. She found great joy watching her six great grandchildren: Nora Leeds, Olivia, Emma, Isabella and David Warchal and recently born, Madelyn David. Peg is also survived by all of her siblings: Donald (Joan) Juli, Shirley (Carl) West and Donna Mosher, nieces and nephews. She had grown very fond of Carol, Vicky and Becky who helped family care for her as she grew tired. Peggy's life will be celebrated with a mass of Christian burial at 10 am, Tuesday, September 25 at Ss. Peter and Paul Ukranian Catholic Church. Burial will be in St. Joseph's Cemetery. There will be no calling hours per Peg's desire. Those wishing may remember Peg with a contribution to Throop Volunteer Fire Department, 7156 Beech Tree Road, Auburn, NY 13021; Ss. Peter and Paul Ukranian Catholic Church, 136 Washington Street, Auburn or Hospice of the Finger Lakes, 1130 Corporate Drive, Auburn as these all played an important role in Peg's summer. "90 wonderful years...Who could ask for anything more?!!!"